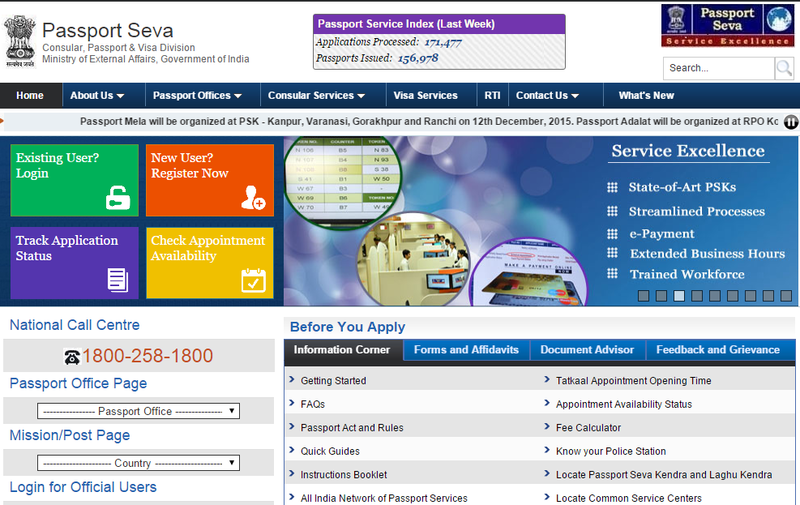 http://passportindia.gov.in is the official website of Passport Seva Kendra in India where citizens of India can Apply for Fresh passport, Renew their Passport, Apply Diplomatic or Service Passport, Apply for Clearance Certificate etc. Fresh Passport can be applied through e-form submission, through Online submission or through district passport cell. Either Normal or Tatkaal can be applied through this. Firstly Register Yourself Under Online Application Filing. After registration Login with the details. After Login click on Apply for Fresh Passport Link in the site. Fill all the required details in the application form and click on Submit. You can save your details on each step so that you can continue from where you had stopped if the internet facility is disconnected. After Submitting the Application Form Click on Manage Appointment for getting an Appointment in the nearest Passport Seva Kendra. You can select any Date and Time slot and attend the Passport Seva Kendra at the Reporting Time. If you are unable to attend the prescribed time and date you can change it. Print the Application Receipt and visit the Passport Seva Kendra with all the Original Documents and 2 self attested Copy of documents. Applicant can Upload the supporting document in the passport seva portal after login. Application Receipt can be print at any time before going to the Passport Seva Portal. If the applicant is a minor who is aged below 4 years he has to carry a passport size photo with white background. Other applicants no need to carry photo as photo will be taken from Passport Seva Kendra. Applicant can apply for 36 Pages Passport or 60 Pages Passport. Minor Passport: Rs 1000 (Till minor attains 18 years or validity of 5 years which ever is earlier). Once everything is finished visit the Passport Seva Kendra (PSK) at the Time which is Printed in the Application receipt. Only one person will be allowed to enter the PSK. (Illiterate applicant can take one person with them). After checking all the documents a token will be given to the applicant and instructed to go on prescribed counter. After everything is done and fees is collected in Cash and photo is taken the applicant will be issued a receipt. Calculate your Fees and bring the prescribed Fees while visiting the Passport Seva Kendra. For more details please visit the website or call the toll free number 1800 258 1800.